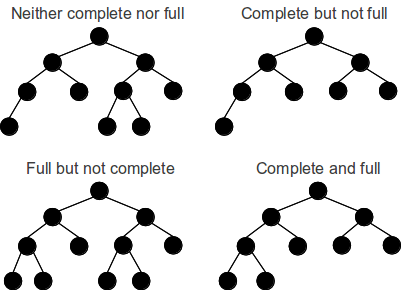 A Binary Tree is full if every node has 0 or 2 children. Following are examples of full binary tree. Practical example of Complete Binary Tree is Binary Heap. A Binary tree is Perfect Binary Tree in which all internal nodes have two children. Hence, all leaves are at same level. A Perfect Binary Tree of height, h has: 2h – 1 nodes. Example of Perfect binary tree is ancestors in family. Keep a person at root, parents as children, parents of parents as their children. A binary tree is balanced if height of the tree is O(Log n) where n is number of nodes. AVL trees maintain O(Log n) height by making sure that the difference between heights of left and right subtrees for any node is 1, -1 or 0. Red-Black trees maintain O(Log n) height by making sure that the number of Black nodes on every root to leaf paths are same and there are no adjacent red nodes. Balanced Binary Search trees are good performance wise as they support O(log n) time for search, insert and delete operations. A Tree where every internal node has one child. Such trees are performance-wise same as linked list.